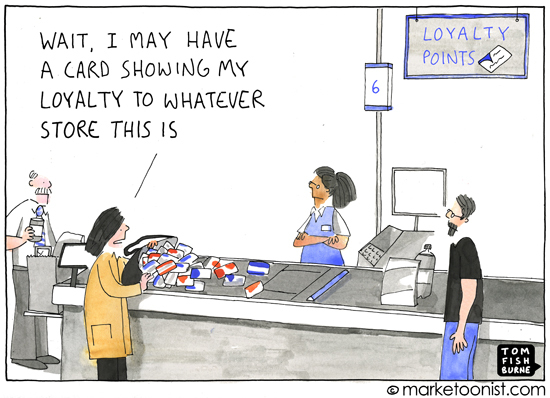 Do loyalty programs attract the least desirable consumers? “Marketers have tended to use the loyalty program concept as an all-purpose marketing initiative, when in fact loyalty programs attract the least desirable consumer for a supermarket wanting to increase its business – the ones who already are loyal and do most of their shopping in your store,” he said. “These shoppers actually have the most to gain – something for nothing. They are more likely to learn about the loyalty program and put in the effort to sign up – because they are already shopping there and most consumers join a program in-store. This entry was posted in Customer Loyalty, Customer Retention. Bookmark the permalink.